In an effort to change this classic combo up a bit, here are a few ways to add some spice to the typical chambray/black outfit. This could be "add a color" as well...but pairing a pattern with this color combo is one of my favorites. Sharon did the same thing, but with a scarf, on Monday, and I thought it was really cute. A statement necklace makes every outfit more fun. PS. Make sure to enter this fun giveaway! I think it's the perfect platform for laying statement necklaces on to! Love these options! 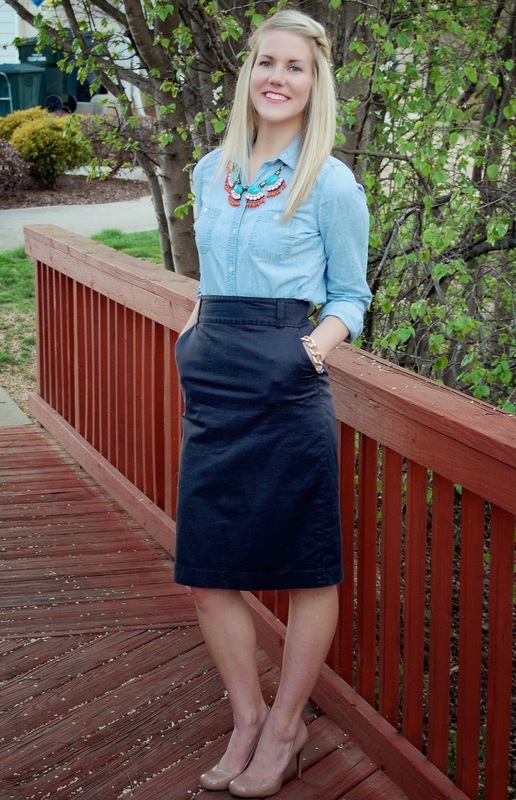 You are so spot on-chambray is such a versatile look. You really can't go wrong! Chambray is a huge staple in my closet. My husband asked me if I really need one in every wash and I looked at him like he was crazy. Of course I do! I'm so glad to see that someone else loves chambray as much as I do! These are such cute looks to mix it up! it's rainy here but yesterday was sunny and great! I will take it! I just wore my chambray shirt and black pants the other day! Thanks for the ideas to spice it up :) And I'm sooo jealous of the 80 degrees! 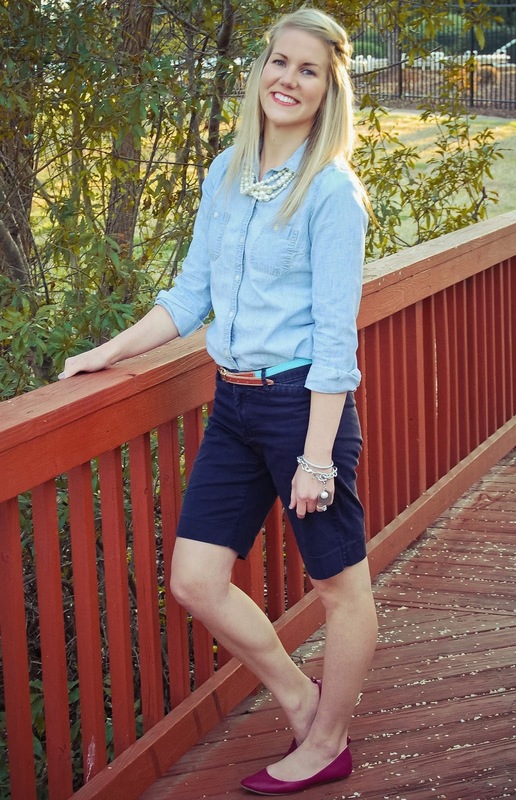 Yay for chambray! Seriously, I don't know what I did without it before. I like all of your takes on it, especially with that bright red coat! Oh yes, totally a favorite combo of mine, as well! I could wear it every day. :) Love all of these, can't pick a fav! So chambray has been in for the last year or whatever and I keep seeing it on the web and think it's so cute! So... I ordered a shirt, and since I cut bangs (reminiscent of my bad childhood haircuts) when I put on the chambray shirt I feel like I stepped right back into the 90's but now I'm a mom! It's not good. Am I the only person this happens to? A girl can NEVER go wrong with a chambray!!! Classic and remixable in so many ways! Nailed all three...you are just too cute!! great outfits - love them all! My favorite is with that gorgeous statement necklace!!! You're gorgeous! Love ya! I think my chambray shirt might be one of my smartest clothing buys ever!